Date 29.03.2016 With its vast desert landscapes, tropical beaches an incredible geological rock formation, Western Australia is a playground for those looking for adventure. Aside from its abundance of natural spectacles and beautiful settings, it is also home to the cosmopolitan city of Perth, and the neighbouring port city of Fremantle – both bustling metropolis’ idyllically located on the Western Coastline Whilst Perth is the most isolated city in the world, life on the West coast offers so much, whilst escape to Western Australia’s stunning countryside is on your doorstep. Perth is a laid-back and liveable city on Australia’s Western Coast. The city has wonderful weather, beautiful beaches and is easygoing in its nature and character. The metropolis is one of the most secluded cites in the world, but this isolation doesn’t detract from the appeal of the city, with its combination of big-city attractions and relaxed and informal surrounds, offering an enticing lifestyle for locals and lots to do for visitors. It’s a sophisticated, cosmopolitan city with plenty of bars, restaurants and cultural activities. The city also offers fantastic open spaces, pristine parkland, nearby rivers and of course the ocean – along with a fantastic public transport system meaning its inhabitants can take advantage on what’s on offer. Arguably one of WA’s most magnificent destinations is Karijini National Park. This impressibve and dramatic geological formation boasts ragged ranges, twisted and warped over time by nature, with fantastic colours that glow in Australia’s beating sun. There is also plenty of rare wildlife to be spotted here, from Wedge-tailed eagles that sour above the natural phenomenon, to dragon lizards and even python snakes. Whilst the narroq, breathtaking gorges with their hidden, sculpted rockpools are Karijini’s biggest draw, the park is also home to a wide variety of fauna and flora, with an estimated 800 plant species. This spectacular national park is also home to three of Western Australia’s highest peaks: Mount Meharry, Mount Bruce and Mount Frederick. 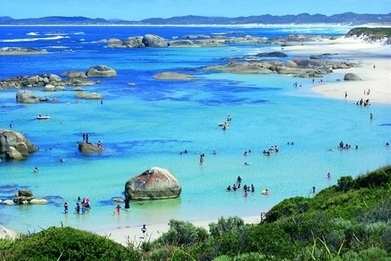 Margaret River is one of the highlights of Western Australia and lies just south of the bustling city of Perth. The town boasts lush vineyards that offer some of the world’s best wines, making the spot well-known for its brewaries and wineries. This destination is also strikingly diverse, with the mouth of the river spilling into the ocean and creating some stunning beaches. These family-friendly beaches are world-renowned for hosting sporting events from fishing to surfing to swimming.